Hey, Folks, there is great news for you all because here, we are going to share all the information about the Railway Recruitment Board ALP Loco Pilot Vacancy 2018 in the below description of the article. Candidates who want to do a Government Job in Railway Department they may check each and every detail from this article and then you may apply online for the recruitment from their respective state wise official website which is given in the below article. Candidates can bookmark our careerjobs360 web page and grab all the details from here. The Railway Recruitment Board will soon release the employment notification for RRB Loco Pilot Recruitment 2018 for 26502 posts of Assistant Loco Pilots and Technician Grade-III in all the boards such as Ahmedabad, Allahabad, Bhopal, Bhubaneswar, Bangalore, Chandigarh, Gorakhpur, Mumbai, Secunderabad, Ajmer, Chennai, Guwahati, Jammu, Bilaspur, Kolkata, Malda, Patna, Muzaffarpur, Ranchi, Siliguri, & Trivandrum. Now the Railway Recruitment Board is looking for the skilled and working candidates post the vacant posts in the department. Interested Job Seekers who want to make their career in Railway filed then they may apply online for the RRB Assistant Pilot Jobs 2018 from the official Website of the department. Candidates may submit their RRB ALP Application Form 2018 on or before the closing date which is not yet released by the Board. Other Details about the vacancy such as age limitations, educational qualification, application fee, etc are given below in the article. RRB is also called as Railway Recruitment Control Board. It is a government organization in India. It was set up in the year 1998 in the Ministry of Railways, New Delhi. Railway Recruitment Boards are the industry under the Govt of India that manages the appointment of new employees to work in Indian railway board. There is 21 regions wise board. For Assistant Loco Pilots Posts: Candidates must have completed Matriculation and Course completed Act Apprenticeship Industrial Training Institute approved National Council for Vocational Training. For Technicians Grade-III Posts: Candidates must have completed Matriculation & Course completed Act Apprenticeship Industrial Training Institute approved National Council for Vocational Training. Candidates can please check the official notification for more education details. Upper age relaxation will be provided to the reserved category of candidates as per the government rules and regulations. Application Form Fee: Application form Fee will deposit by the aspirants in the shape of Indian Postal Order in the Secretary/ Member Secretary/ Assistant Secretary/ Chairman of RRBs concerned computerized post offices through E-Payment. The RRBs shall not accept any Outstation Draft. How to Apply for the RRB ALP Loco Pilot Recruitment 2018? Initially, you have to visit the official website of Railway Recruitment Board Zonal Wise. After that, click on the link and open it in the next web page. Then, read the official notification very carefully before applying for the vacancy. After that, click on the apply online button. Now, fill the application form with all the correct information without making any mistake. Then, hit the submit tab button and submit the application form. 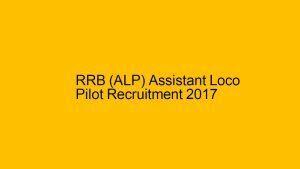 Here, we provide all the details about the RRB ALP Loco Pilot Recruitment 2018 in the above description of the article. All the eligible candidates may apply online for the given vacancy from the zonal wise official website which is given in the above article. If anyone facing a problem while applying for the vacancies then they can leave a comment in the below comment box then we will help you as soon as possible. For more information, you can bookmark our careerjobs360 page and stay in touch with us for further reference.